A while back I spent a month in the Languedoc region of southern France, and did we do some great eating. Here's the local specialty. 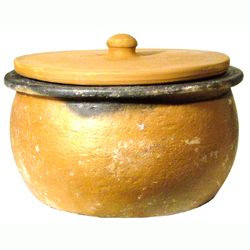 Cassoulet was originally cooked in the ovens of the village bakery with every family having an earthenware dish with their own symbol or crest on it, the first part was done at home and the dish dropped off at the bakery to be picked up on the way home from the fields the next day. And as much duck fat as your conscience will allow. Blanch the beans in boiling water, skimming of any foam, 20 minutes should do it. Change the water, add the studded onion, and bouquet garni, bring it all to the boil and turn it right down to the lowest simmer you can set you hob to. You'll need to cook this part for about 1.5 hours. Brown the pork in some duck fat, a few pieces at a time and set aside. Brown the sausages and set them aside. Brown the duck legs and set them aside too. Brown the pork rind in some more duck fat, then add and sweat the chopped onion down to mush, adding the garlic when the onion is well under way so as not to burn it. Put all the browned parts in an oven proof dish, cover with water and simmer until everything is cooked. Assemble the whole lot in an oven proof dish, making sure there are a good layer of beans on the bottom to avoid sticking. Add the wine and top up with water. leave the whole lot to stand, traditionally over night, but I usually just wait until the oven is up to 180c. Cook for about 1.5-2 hours adding more water if you need to. Serve with proper bread, a big red, and finish with a fat cigar.